Information regarding the 2019 John & Georgette Chambers Memorial Golf Tournament Coming Soon! 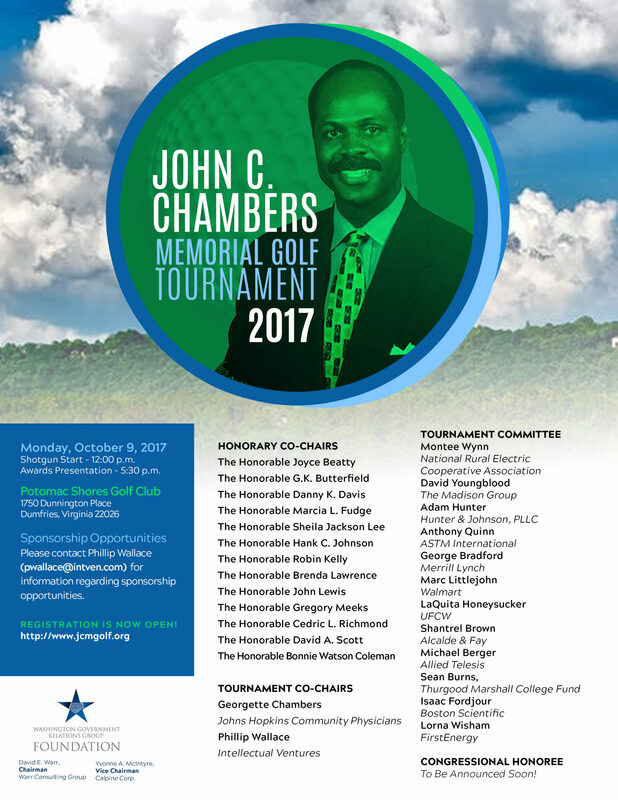 The John & Georgette Chambers Memorial Golf Tournament is the annual fundraiser of the Washington Government Relations Group Foundation (WGRGF). The Foundation is charged with generating funding and support resources for minority undergraduate and graduate students pursuing careers in public policy, public administration, political science, community engagement or other advocacy disciplines. The annual golf tournament has attracted an average of 70 attendees, 60 golfers and $26,000.00 in sponsorship dollars. The Foundation relies on the support from sponsors to plan, resource and execute the annual golf tournament as well as on-going fundraising activities throughout the year. WGRGF is also seeking amateur, mid-level and pro golfers to purchase tickets to participate in the annual tournament.